Maybe not the greatest photo, but it sure was the greatest chocolate. Brook was asking me what kind of cake or pie I would like for my birthday. As I thought about it, I decided that if it really was my day to have my favorite things, I was going to have to make my own chocolate… I just like my own recipes the best. (Of course if it had really been all about me, one of the recipes would have had chipolte, or habanero pepper. But, Brook’s dad would be joining us later in the day. Tougher than nails in most every way, but he can’t handle the hot stuff.) Since I wanted it to be fun and fast, I decided to use the BadaBing Chocolate instead of the Guittard. No worries about tempering; still a very nice flavor. So, what did I make myself for my own birthday? Naked Chunk and Cherry Jazz Hearts. Naked Chunk is just as easy as a recipe can be. Melt milk chocolate, add bare naked granola. My favorite for this is their “Peak Protein” granola. Cinnamon, raisins, soft crunch. To form the chunks, I used a silicone ice-cube tray I bought at Bed, Bath & Beyond. 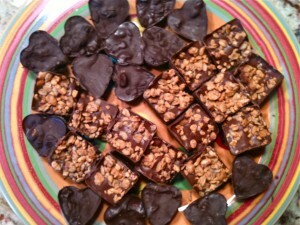 I put a layer of chocolate on the bottom of each “cube”, then add the granola, then pour chocolate over the top. Each piece ends up a similar size to a Chunky Bar. One really gets to sink the teeth into these nuggets! The Cherry Jazz Hearts came as a surprise, even to me. They happened as I was making them. I got a bunch of stuff out of the cabinets to take an inventory of possible ingredients. I had a lot of dried sour cherries. These are so good with dark chocolate that it blows my mind. It would have to be very dark chocolate! Nuts go well with almost everything. 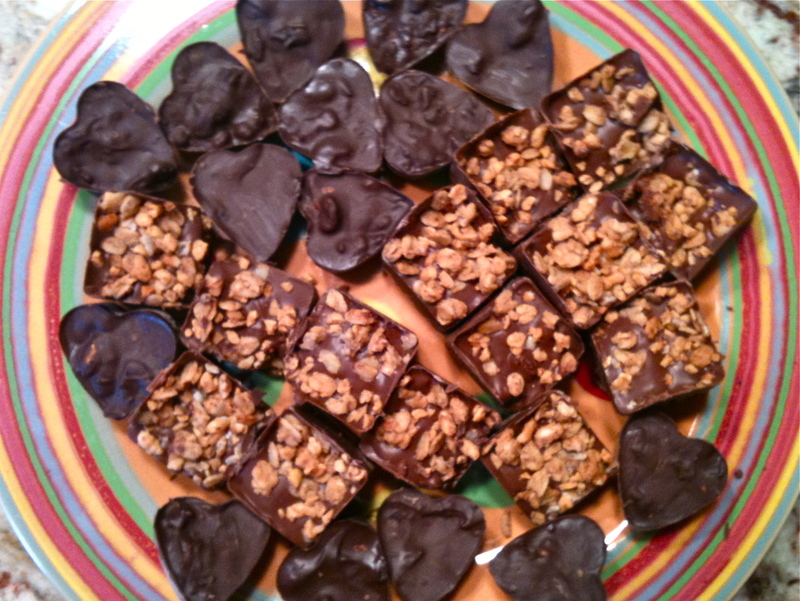 I like a lot of textures in my chocolate… I decided on walnuts. The fun part was that while I was pulling the variety out of my cabinets, a packet of jasmine tea pearls fell on me… in my face, as it were. I realllllllly love jasmine in chocolate. I wondered if it would be worth the risk. I used my secret trick of popping the ingredients in my mouth together…. OH YES… This would work out perfectly! And it did! I made them in heart shaped silicon ice cube trays, also from Bed, Bath & Beyond. I was concerned that Brook’s dad wouldn’t like this one. But we all agreed that this was a good as chocolate possibly could be. HAPPY BIRTHDAY TO ME~!